Accuweigh recently supplied forklift weighing scales to a hire company in Queensland to fit to a forklift truck for invoicing purposes. The hire company required a printed record of weights of relocated materials to be maintained for billing. 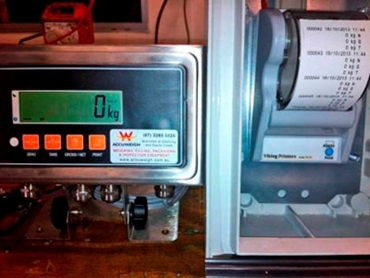 Supplied by Accuweigh’s QWM branch in Brisbane, the forklift weighing scales included a pressure transducer, a digital weight indicator and a tally roll printer. The stainless steel enclosure of the weight indicator is rated at IP65 to eliminate potential water damage when the forklift is operated in outdoor or wet conditions. The high quality pressure transducer is plumbed into the forklift’s hydraulic lines to accurately sense hydraulic pressure, which is then output as an analogue reading (mV/V) to the digital weight indicator for conversion into a digital weight reading. The tally roll printer used in Accuweigh’s forklift weighing scales is designed for DC operation and mounted inside a sealed enclosure to prevent dust and moisture contamination of the loadcell mechanism. The stored weight readings record is removed at the end of each shift. Accuweigh has extensive industry experience with supplying on board weighing systems for forklifts and front end loaders. Accuweigh operates a network of eight branches across mainland Australia to provide superior product support on all scales and weighing equipment.